Tonally an absolute wreck, Yann Samuell's direct-to-video remake of the resonant Korean romance My Sassy Girl says everything that should've been and properly was left unsaid in the original while, in turn, neglecting to say every poignant thing that its counterpart hammers down just right. Hollywood, leave well enough alone; all of the beautiful cinematography and blubbery theatrics in the world can't compete with a solid story told with more eloquence and humor in its pinkie than this mistake of a saccharine rom-com. It's just terrible. My Sassy Girl, no matter which version we're talking about, rotates around the concept of chaos and fate as the agents of true love. It involves the story of a girl, someone unwaveringly addicted to drinking and haphazardly causing a scene everywhere she goes, and the guy who is willing to see through her destructive ways. With the Korean counterpart, the male character is brought up as an effeminate and non-studious entity with an aggressively mean mother smacking him with anything nearby when he stumbles home at late hours. He, by chance, runs into this fanatical drunken girl in the subway and saves her from being plowed by a train. What ensues is one of the strangest nights that the boy has ever encountered, filled with vomit, police investigation, and ultimately some time in jail. The fact that the two find their way back to each other is ridiculous, but the wayward mechanics of fate make it seem understandable in its context. Now, part of what makes the original My Sassy Girl a real achievement is the grand departure from gender stereotypes that the characters exude. It anchors the "truth behind stark opposites" dynamic across the film as the girl, inexplicably left nameless for the original, exploits our guy's weakness with women and drags him through the mud for kicks and giggles -- even though she has, as we pick up from her mannerisms, something darker lying inside. Each character is compellingly strange and integral to the graspable strength within the film, which helps the narcissistic rhythm of Nameless' affectionate punishment. It's probably fair that I mention my fawning adoration for the original Korean film at this point, possibly more than most might express since romantic comedies rarely tap into my emotional side. Now, for the matter at hand: you know that weird feeling you get when you hear a familiar song you like that has been horribly re-recorded by some modern artist -- and it makes your skin crawl? That's a good encapsulation of the feelings I had surrounding this "re-mix" of My Sassy Girl. Nails on a chalkboard are symphonic compared to this almost high-school rendition of a solemn love story. Yann Samuell's remake alters the couple drastically, both in reactionary tone and dominance structure, yet it keeps a good hunk of the nameless girl's crazy antics from the original. Since these activities rely so heavily on its distinct characters, the tone of the film now feels ... odd. Odd and unjustified. Our guy, named Charlie (Jesse Bradford, Swimfan) here, isn't effeminate; instead, he's an aspiring business student who comes from French Lick, Indiana where his parents, the "nicest parents ever", encourage him to become a corporate Tiller King representative. Right. He's a static and humdrum lead, one that can be found along the aisle of any movie rental shop in their "Sappy Romance" section. 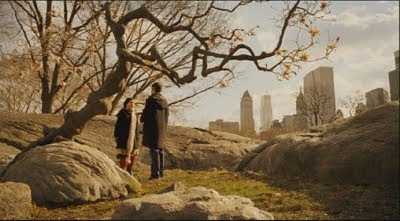 Once Charlie runs into Jordan Roarke (Elisha Cuthbert, The Girl Next Door), the astronomically wealthy daughter of a doctor, he has a cookie-cutter moment of swooning over her radiance before their rendezvous in the subway. Elisha Cuthbert's Jordan is only mildly aggressive, feels uncomfortably weak when she berates random strangers for their misplaced cigarette butts, and doesn't come close to being suitably bitter or threatening enough for "the sassy girl". All this might seem like bully-ish nitpicking, but this is a specific kind of character film that relies on our comprehension of motives and eccentricities to find its rhythmic resonance. When you consider the fact that Jordan and Charlie have next to no chemistry, both in the poorly-adapted writing and from the Bradford-Cuthbert frappe of a bond, it's more like watching a weaker take on 10 Things I Hate About You without the Shakespearean charm. It's a shame, because with a more cohesive script, a completely different male lead, and a smoother rhythm, I could've bought into and even really liked Elisha Cuthbert as the focal Nameless / Jordan. However, when plopped in the middle of this beautifully shot mess, she's just another mismannered, spoiled rich girl acting out until love smacks her in the face. A lot of its triteness comes in the fact that very little remains unvocal in this new My Sassy Girl. Many of the intrinsic and pensive moments that could've existed between Jordan and Charlie are brought to vocal life in very blunt and lackluster fashion, thus removing the hints of romantic intrigue that would have amplified their connection. The relationship that's at the heart of the original is a vague and intuitive one, a thoughtful level that remains nonexistent here. Instead, in typical easy-to-digest fashion, we're treated to the now-named woman explaining her unbridled spirit to an only marginally awkward boyfriend. It's as if the filmmakers concocted a list of all the stuff that wasn't explicitly outlined in the original and elaborated on those moments to death. Those tender moments, the subtle ones that might have tapped on our attentive shoulders in other circumstances, now remain swallowed in unambiguous melodrama. Samuell's film, which is textually faithful to the original My Sassy Girl in a heartless Cliff's Notes kind of way, feels about the same as driving a '69 Mustang Boss with a weak 4-cylinder engine under the hood: it operates and might possibly sound remotely similar to the real deal, but the performance and experiential aspects of the ride don't come close to delivering what the attractive outside promises. There's a devastating amount of humor and aggressiveness lost, even backstabbed, in its regurgitation to the English-speaking audience that could've been easily translated over. Instead of concentrating close attention to these necessities, it makes a premeditative decision to try and meld its moods and motives onto the modern concept of an uppity fairy-tale romance -- something that My Sassy Girl just isn't.